Nokia has been coy amid the speculation of a supposed smartphone running on what we’re led to believe will be a ‘forked’ version of Google’s Android, but with the Mobile World Congress drawing ever closer, the well-guarded secret is becoming increasingly difficult for the Finnish company to keep under wraps. 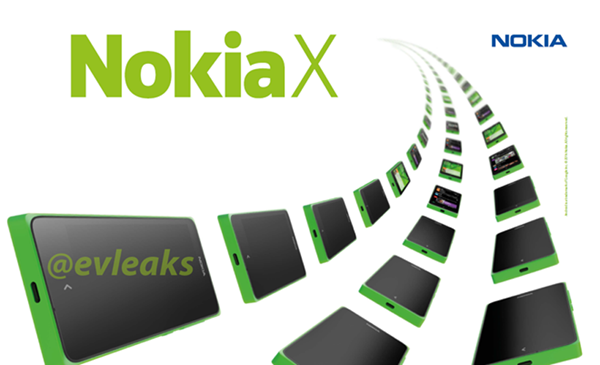 Today, prolific leaker Evleaks has come through with yet another press image of the supposed ‘Nokia X’ handset, and although the fact that Microsoft is in the processes of purchasing Nokia throws up quite the conflict of interests, it’s looking more likely than not that the Lumia maker will be pressing ahead and showcasing the Nokia X next week. The notion of Nokia building a device on Android had been prevalent long before the company was acquired by Microsoft back in early September, but with the Xbox maker having thrown a few billion dollars onto the table for a chance to own Nokia’s products and services department, the speculative idea of an Android smartphone appeared all-but dead in the water. Yet, as time has gone on, the rumors have not ceased, and with less than one week until MWC 2014, the prospect of the Nokia X being announced on February 24th looks very likely indeed. Since it will probably run on a forked version of Android, we’re expecting a tiled interface à la Windows Phone, and an ecosystem focused heavily on Microsoft and Nokia’s own range of apps and ideas. The device itself is purportedly of the mid-range denomination, with a set of decidedly average features in line with reports of a roll-out to emerging markets. Since Microsoft is close to sealing the deal to acquire Nokia, this could well be the first and last Android handset bearing the famous branding. However, with suggestions that Microsoft considering Android app support as the WP Store continues to struggle, perhaps the Nokia X represents the initial courting phase of a long marriage between Nokia/Windows Phone and Google’s open-source ecosystem. Whatever the case, we will be at this year’s Mobile World Congress, covering, in some detail, the announcements of Microsoft and Nokia, so be sure to stay tuned to our coverage here at Redmond Pie throughout the duration of the event!